Tomorrow night is Santa’s time to shine – and I totally agree with milk and cookies as the preferred snack of bearded men who drop down chimneys. However, I also think that sometime you need some fruit to go with your cookies and milk. 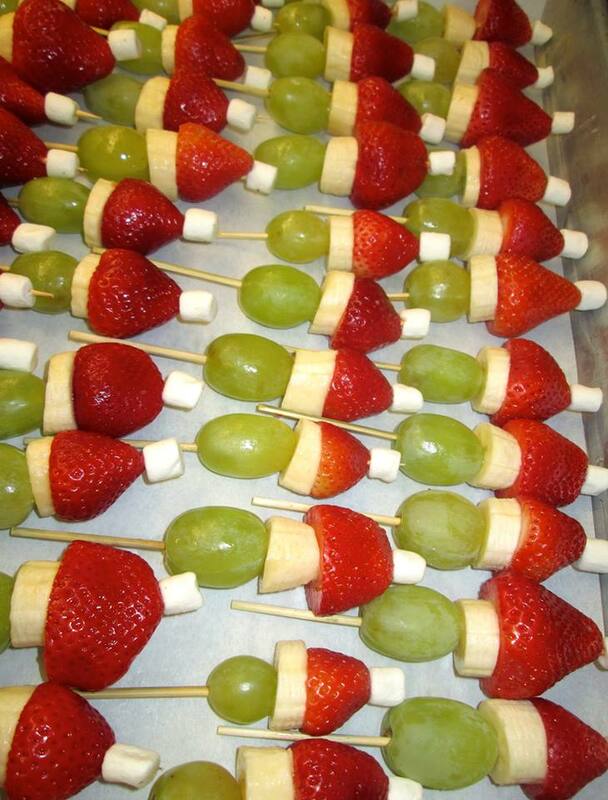 With that in mind, here are two Fruitastic Santa Snacks – and a veggie one too, just for good measure. 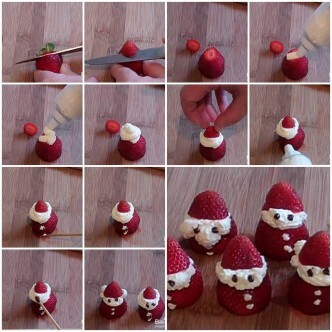 These Strawberry Santa Snacks are super easy – and you still have time to buy the three ingredients you need: berries, cream cheese (or substitute whipped cream) and mini-chocolate chips. These are so sweet that Santa may just need a glass of ice cold milk with them. 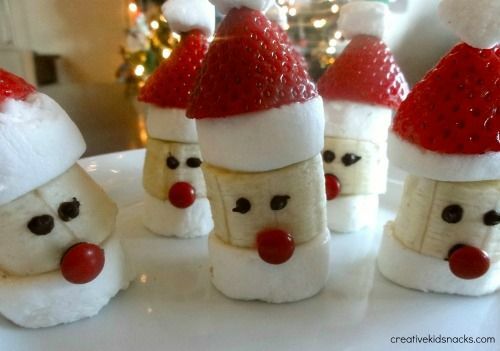 These clever Santa Poppers have three more ingredients: Bananas, marshmallows and red candies. That’s a little more sugar – but also perfect with a tall refreshing glass of ice cold milk. Step-step-by-step instructions are available at the link above – and you get to eat all the extra fruit pieces while you are making them! 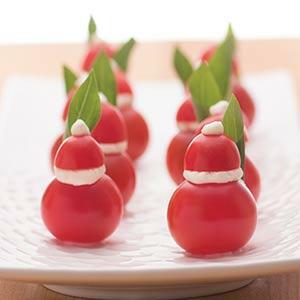 And, because I could not resist, how about some Tomato-Goat Cheese Santas? The recipe link calls for some brand name cheeses, but I am guessing your favorite soft cheese combination would work just as well. I would definitely make these if I hadn’t already committed to a ‘pine cone’ cheese ball made with almonds. So many cheesy appetizer opportunities, so little time! 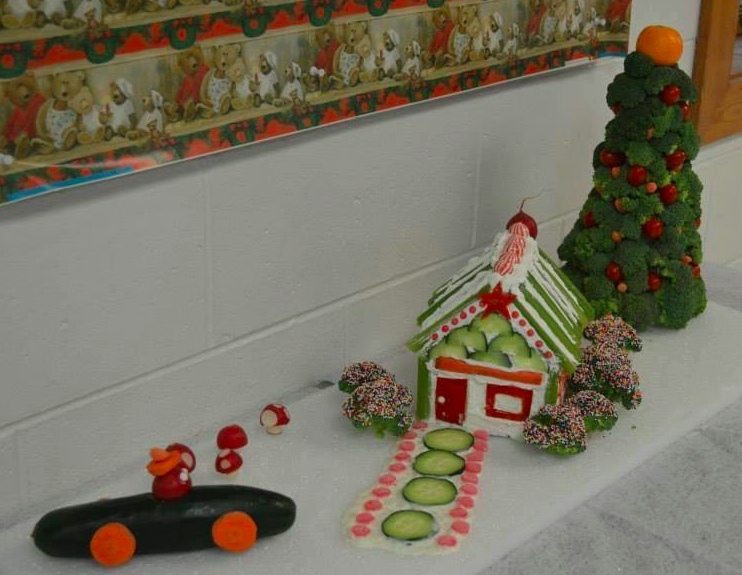 31 Days of #RealSchoolFood: What Makes Fantastic #FoodArt? If you like fun food and spend any time on Pinterest or even Facebook (especially on school lunch bento box pages), you may have already over-dosed on holiday cuteness. I myself have blogged about #RealSchoolFood art here twice – using actual school photos on Days 7 and 18. So why talk about it again? Like with many Christmas things gone awry, I’d like to blame it in the Grinch – specifically THIS Grinch, shared recently by Chartwells K12 on their Facebook page. After just a few hours, it is already one of School Meals That Rock’s most liked photos – and the question is WHY? What makes #FoodArt FANTASTIC? I’d like to suggest three factors – and I’d love to hear your thoughts as well. #1. Recognition: This is very clearly the Grinch – in color and expression. 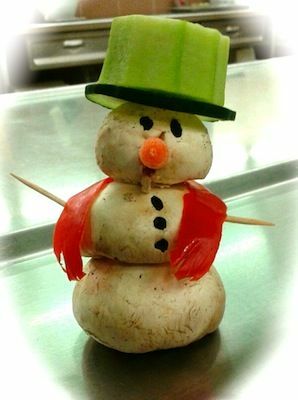 In the same way, there is no doubt that this creature from the #FoodArt celebrities in Provo School District (UT) is a snowman. #2. 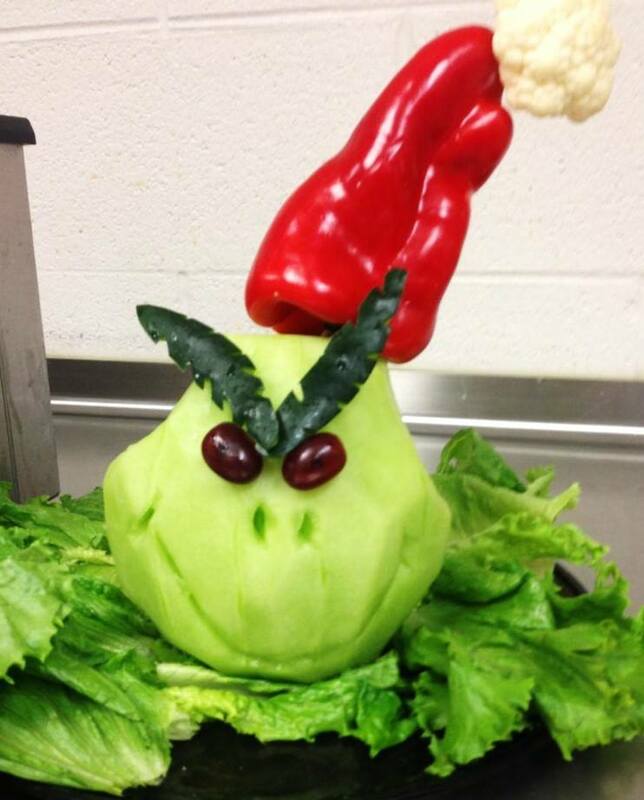 Serendipity: The red pepper on the produce Grinch looks amazingly like the hat that Dr. Seuss originally drew for How The Grinch Stole Christmas. 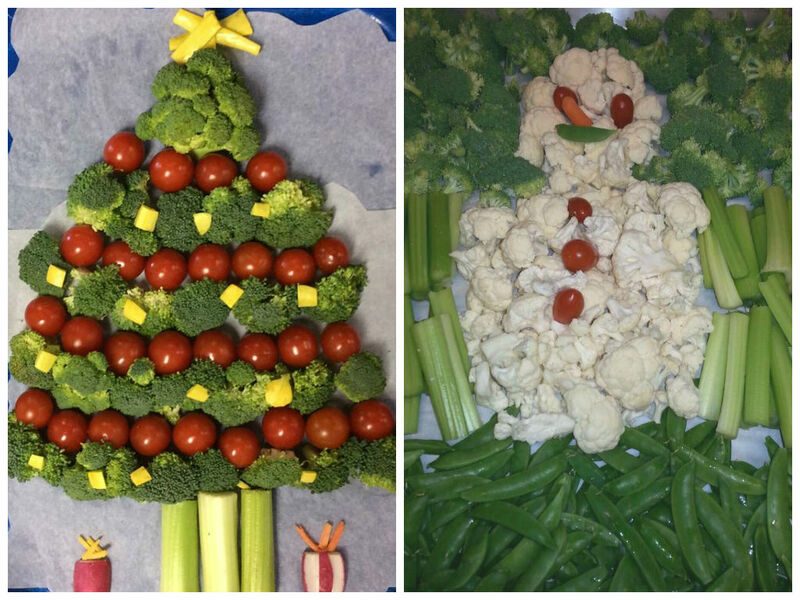 The mushrooms on the snowman really look like snow balls – while broccoli and cauliflower really make perfect poodles (one of the School Meals That Rock previous record-breaking posts). #3. Simplicity: Perhaps the most important attribute of FANTASTIC #FoodArt is that it is simple – it looks like some thing we could actually make with the implements we have available. The Grinch, snowman and poodles all look pretty easy – almost like why didn’t think of that? 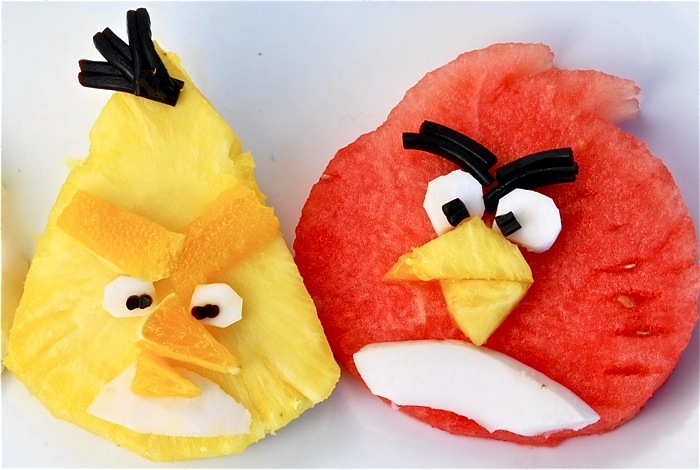 These Angry Birds are another example of made simple – real simple. 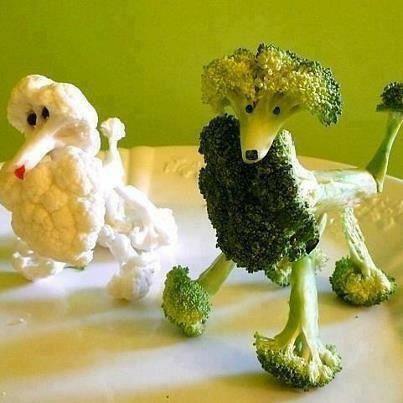 Want more ideas for simple, serendipitous, recognizable food art? Please check our School Meals That Rock on Pinterest – or scroll through the photos School Meals That Rock’s Facebook page. Our friends from Provo, Utah, are a great resource on Facebook and Pinterest – or just use your friendly search engine. Type is something like strawberry hearts and you will find thousands – if not millions – of ideas. 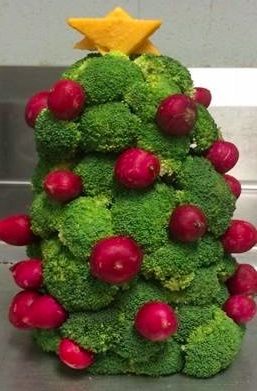 This simple broccoli Christmas tree was decoration on the serving line at West Chatham Elementary today in Savannah-Chatham County Public Schools, Georgia. Thanks to Director Lydia Martin for proudly sharing what her staff had created. 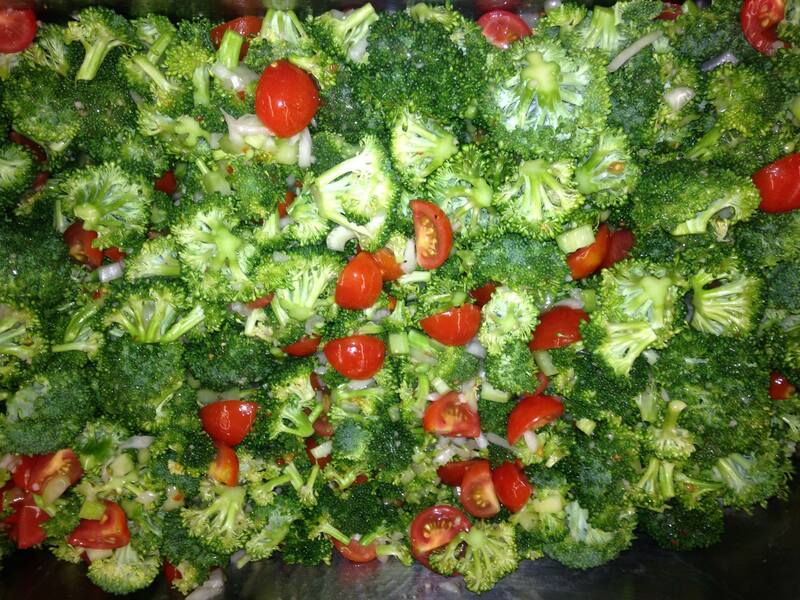 Flat Veggie Trays have been very popular on Pinterest, including the School Meals That Rock Christmas Food Fun board. These two come from districts at opposite ends of the country – Coppell ISD in Texas (L) and South Haven in Michigan (R). Easy to make – and very fun for students! 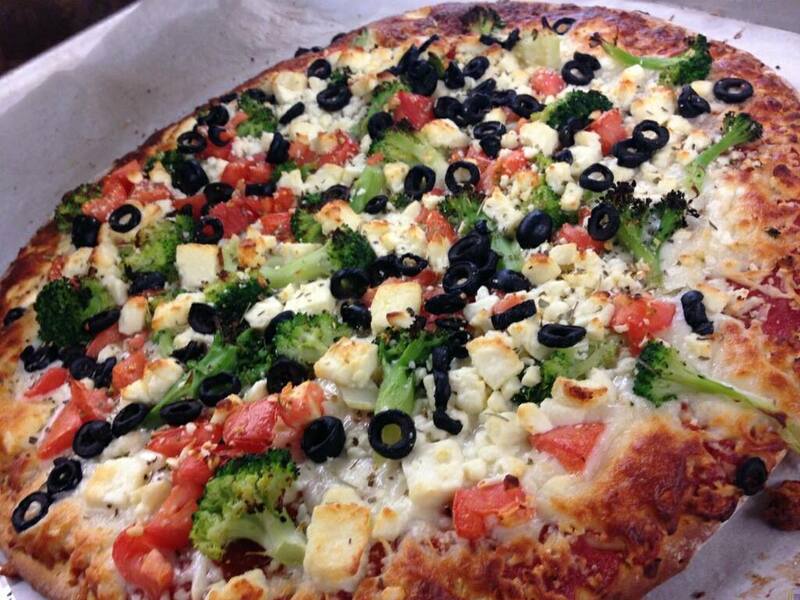 School lunch can be very festive without being ‘arty’ both this Greek Pizza from Mast Way Elementary Oyster River Child Nutrition, New Hampshire, and the Broccoli Salad from Shaw School, Millbury, Massachusetts, are deliciously colorful examples. 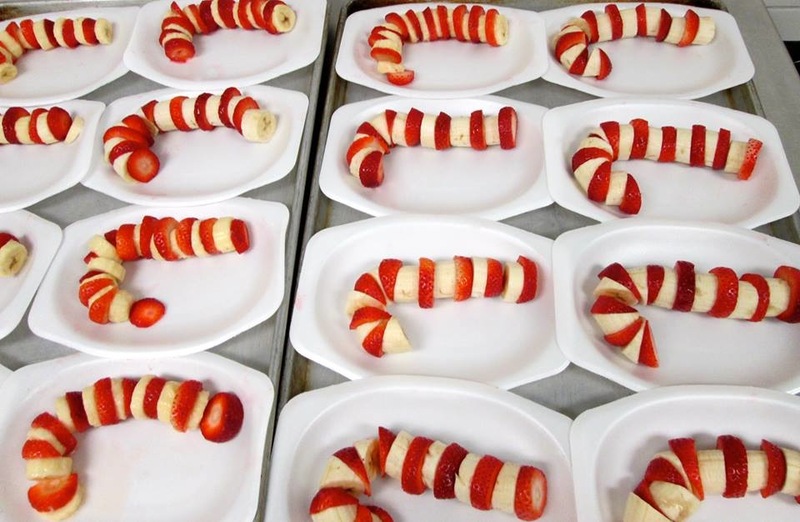 Thanks to every school nutrition professional for preparing beautiful, delicious and often fun food for hungry children. Enjoy your winter break – we hope some cooks for you!